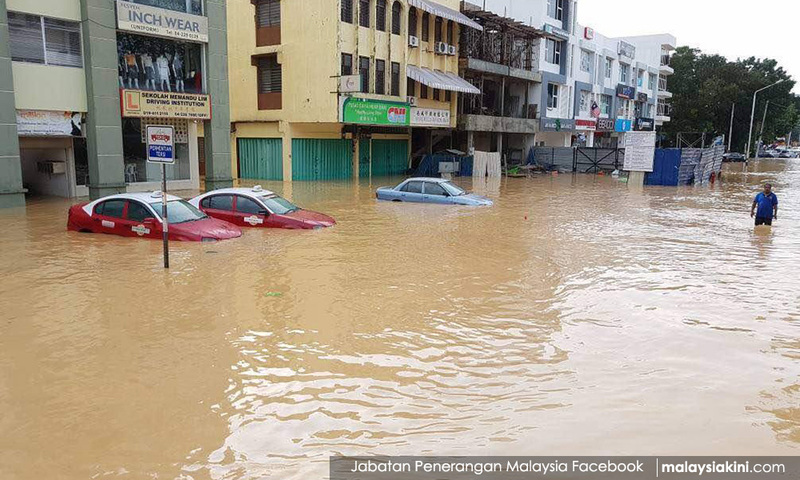 At least seven people have been confirmed dead in Penang after devastating floods triggered by the heaviest rainfall recorded in Penang's history. The seventh victim found today, is a yet to be identified man, whom police said was found covered in mud and stuck to the ticketing gate of the Bandara Stadium in Jalan Dato Keramat. Five of the other victims have been identified as Malaysians. Northeast district police chief Anuar Omar said one of the victims was 45-year-old Tan Ah Peow. Another victim was 97-year-old Chong Sin Thon, who was found at his home in Air Itam at 1PM. 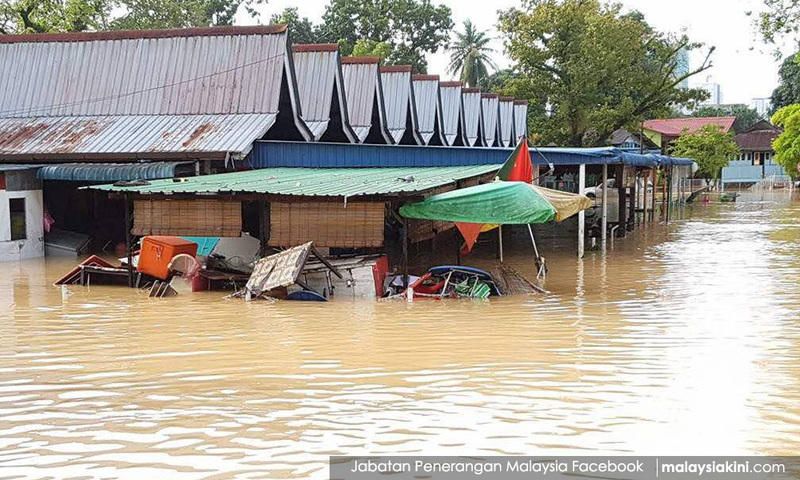 Anuar said three of the other victims were from Taman Free School, Jalan Perak and Jalan P Ramlee on the island, which are known to be flood-prone areas. "One victim is a 75-year-old Indian Muslim male who drowned in his home. His body was retrieved by the Fire and Rescue Department and sent to the Hashim Yahya Mosque relocation centre," Anuar told reporters in Georgetown today. The man has been identified as Amanullah Shabib Kalandir. "The other victim is Lau Guek Jee, a 64-year-old Chinese woman from the Jalan P Ramlee Paschal nursing and senior citizens' home. "Her body was also retrieved by the Fire and Rescue Department and sent to the relocation centre at the Hashim Yahya Mosque. "The third victim is 78-year-old Chew Eng Lean," said Anuar, without elaborating further. State executive councillor Phee Boon Poh had also confirmed the death of a Bangladeshi male in Bagan Dalam, Seberang Perai last night. "He died due to fallen trees, and we are awaiting more details about him," Phee told Malaysiakini. 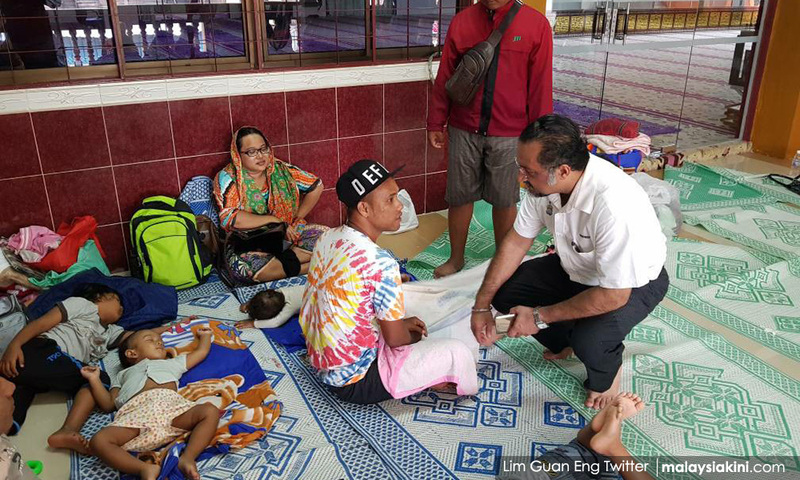 Thus far, two relief centres – Hashim Yahya mosque and a surau in Taman Free School – have been opened to deal with flood victims. Penang Water Supply Corporation chief executive officer Jaseni Maidinsa said Penang was experiencing a historic amount of rainfall. "The Sept 15 flood had rainfall as much as 70mm. 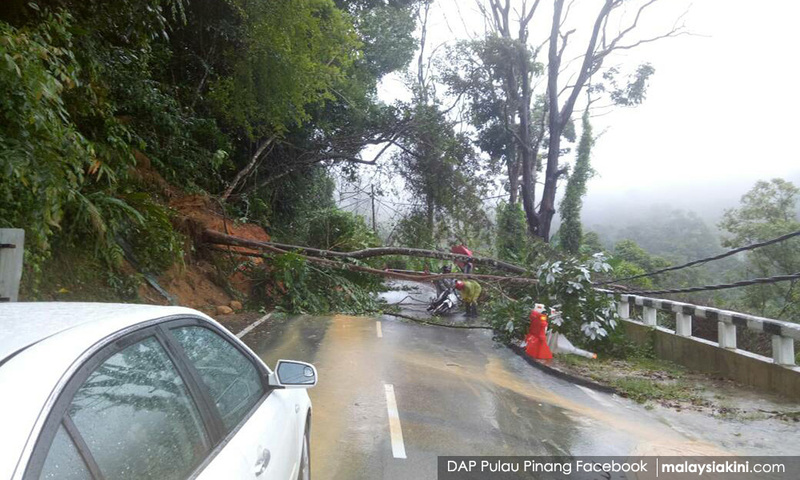 Last night's was 315mm, the highest in Penang's history," he said. Penang was hit by flooding since yesterday evening as strong winds lashed across the island and mainland, uprooting trees, damaging roads and buildings and stranding vehicles. causing massive traffic jams. Flights and bus routes were interrupted, and some areas in Jelutong suffered blackouts. Tanjung Bungah assemblyperson Teh Yee Cheu said several projects, including Bolton Surin in Chee Sent Garden, Tanjung Bungah, saw its road and housing units collapse due to the strong winds. 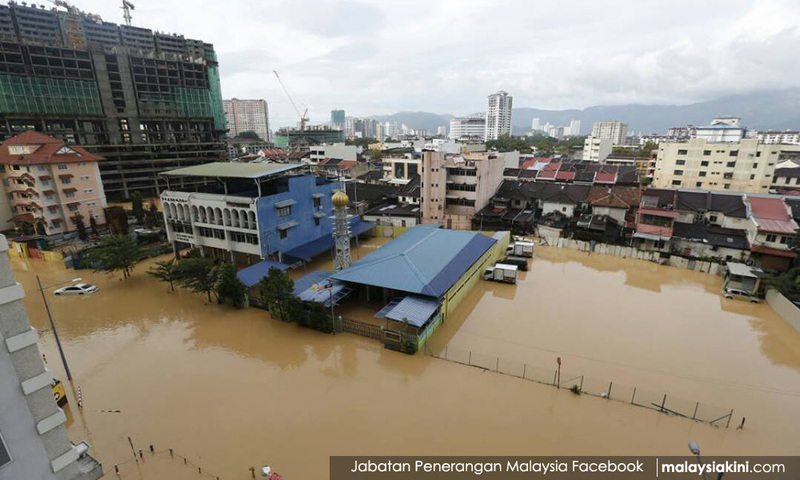 "The road and homes were built near a hillslope, and a multi-level carpark of a condominium had crack marks, while the carparks in Taman Sri Set and Permai Jaya's entire carpark was submerged in water. 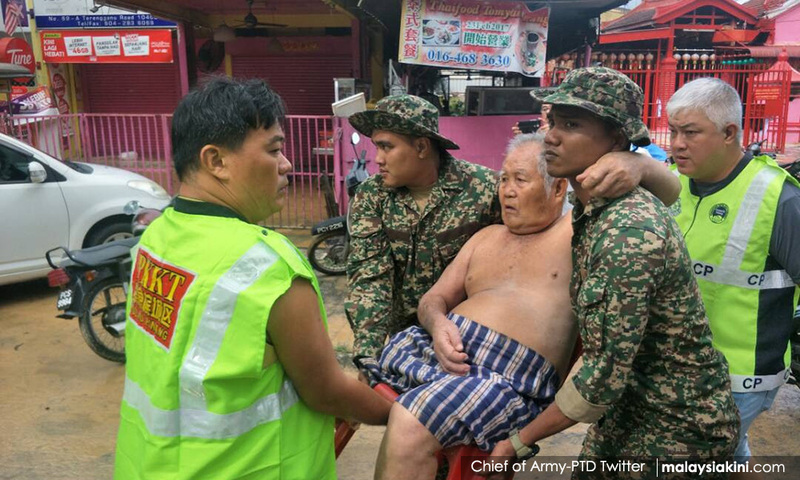 Bukit Mertajam MP Steven Sim appealed for assistance, and issued a call for volunteers, saying that food and clean water, as well as trucks or vehicles which can access flood areas are needed. "What we did last night was to manually drag boats through the water. It is very slow and exhausting, most of our volunteers need rest after more than five hours walking in waste, dragging boats. Penang Chief Minister Lim Guan Eng had described the disaster as unprecedented and appealed to the federal government to deploy the military for assistance. The Malaysian Meteorological Department had last night also issued a heavy rain warning with Penang and parts of Kedah receiving a "red" notice, warning that the situation will persist until today. Parts of Perlis, Perak, Kelantan and Terengganu are also affected, but not as severely. Typhoon Damrey made landfall in Vietnam yesterday, killing at least 19 people. The category 2 typhoon had since weakened to a tropical storm. Concurrently, the Pacific Disaster Center and typhoon tracking portal cycloane.com reported the formation of a tropical disturbance over the Malaysian peninsula which is referred to as "invest 95W." The tropical disturbance is unlikely to develop into a tropical storm but will cause erratic weather.